Aiseesoft Blu-ray to MP3 Ripper for Mac would be your best helper to convert Blu-ray disc to MP3 and other popular audio formats. This Mac Blu-ray to MP3 Ripper can help you extract the perfect-sound MP3 file. Apart from the Blu-ray, this Blu-ray to MP3 Converter for Mac can also convert DVD and any popular video formats to MP3 and other audio formats.You can trim a specified video segment and convert it to MP3. ...... Also you are able to merge several videos together and output them to a single MP3 file. 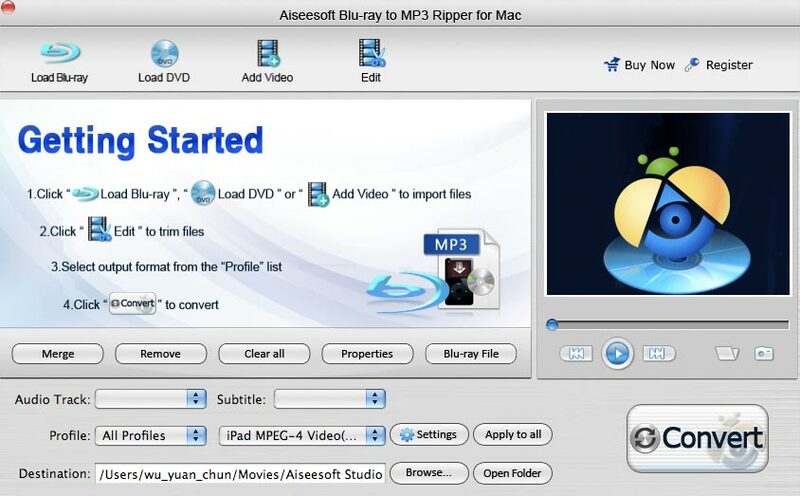 Aiseesoft Blu-ray to MP3 Ripper for Mac can help users extract MP3 file from Blu-ray disc, DVD and popular video files. This Mac Blu-ray to MP3 Ripper can help you remove any copy protections (AACS, BD+, MKB V24, etc.) from Blu-ray disc. You are able to trim any segment of a Blu-ray movie by setting the start and end time. Then you can convert this video segment to MP3 file. For better enjoyment, the Blu-ray to MP3 Ripper can help you merge several video and audio files together, and output them to a single MP3 file. You can adjust Audio Encoder, Sample Rate, Channel, Audio Bitrate to get customized output audio. Qweas is providing links to Aiseesoft Blu-ray to MP3 Ripper for Mac 3.1.32 as a courtesy, and makes no representations regarding Aiseesoft Blu-ray to MP3 Ripper for Mac or any other applications or any information related thereto. Any questions, complaints or claims regarding this application Aiseesoft Blu-ray to MP3 Ripper for Mac 3.1.32 must be directed to the appropriate software vendor. You may click the publisher link of Aiseesoft Blu-ray to MP3 Ripper for Mac on the top of this page to get more details about the vendor.